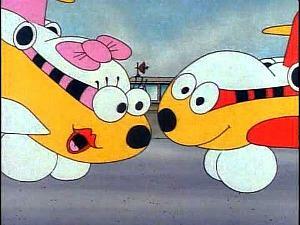 This British cartoon originally aired on BBC1 during 1985 and 1986, and was then repeated again in February 1987. There may well have been repeated episodes since then, although I haven't been able to find any reliable information on this. 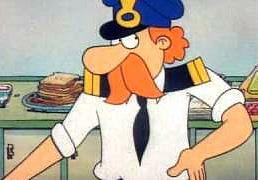 25 five minute episodes were created by cartoonist Peter Maddocks who was also responsible for The Family Ness (shown on BBC1 from October 1984 to March 1985) and Penny Crayon (1989-90). 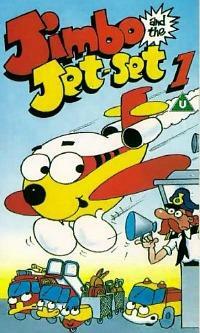 The lead character was, of course, Jimbo the talking jumbo jet. His unusual, compressed shape was the result of his designer failing to know the difference between inches and centimetres. It wasn't only a talking aeroplane that featured in the series, other airport vehicles could also talk, and even the steps to the plane were characterised! But can you remember the name of all the characters? I'll put you out of your misery. 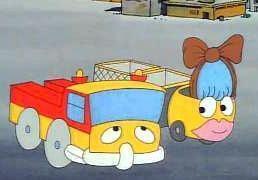 They were Amanda Baggage, Claude Catering, Harry Helicopter, Phil The Fuel Truck, Sammy Steps and Tommy Tow-Truck. Occasional appearances were also made by Old Timer, an old bomber plane on it's way to an airshow. I believe a female plane called Gloria Gatwick also once made an appearance but didn't speak. The cartoon was narrated by Peter Hawkins, a well-known voice artist who also provided voices for numerous children's animations including Bill And Ben The Flower Pot Men, Captain Pugwash, The Family Ness and even the Daleks in Doctor Who! Actress Susan Sheridan also provided voices, and she also worked on The Family Ness, as well numerous other animations. 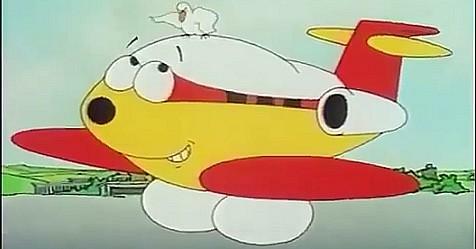 Jimbo falling in love with a girl aeroplane in the episode "Holiday Weather"